When you update or upgrade a system, you might not only want to upgrade the system itself with the new functionality that is provided by SAP, but you might want to include your own transport requests. This is for example the case if you create your own releases that provide your custom specific functionality to your users, or if you need to transport upgrade specific adjustments. For this, you need to create a buffer file which contains the (data of) the relevant transport requests. Up to now, this buffer file could only be created either by creating a virtual system in the Transport Management System, or creating a transport buffer file using the command line tool tp. With the new tool described in this blog, the way to create a transport buffer file will be much easier. The Software Update Manager provides you the feature to integrate multi-client customer transports into the update procedure to reduce business downtime. 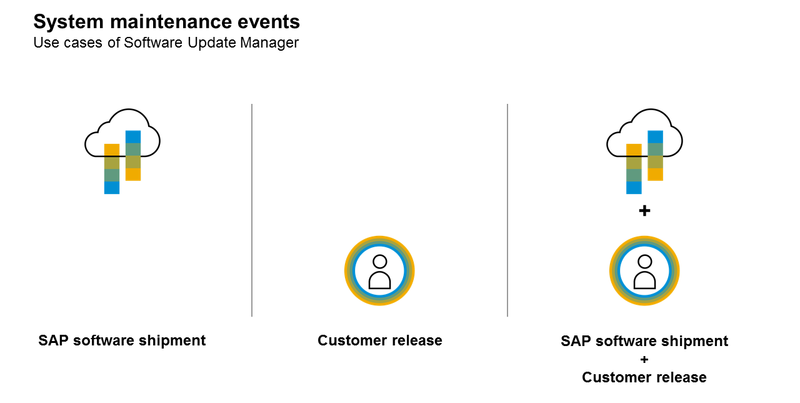 As you can see, you can use SUM not only for updating SAP software, but also for updating customer releases as well. To make use of the feature Customer Transport Integration, you need to provide a customer transport buffer file to SUM. Of course, the tool of choice to generate the customer buffer file is the new tool called Upgrade Transport Integration Wizard described in this blog. For more information about customer transport integration in SUM, check the chapter “Integrating Customer Transports into the Update Procedure” in the standard guide for SUM. The guides can be access via the Software Logistics Toolset landing page in the support portal in section System Maintenance. The Upgrade Transport Integration Wizard is a browser based tool. To open it, log on to your ABAP system and call transaction SUPGINT_APP. This will open up the Upgrade Transport Integration Wizard in a browser window. If this is the first time that you use this wizard, you can only Create New Upgrade Integration Task. Click Next to do so. If you started creating a new task before, you can choose the one that you would like to continue working with from the drop-down box. Click Next after that as well. Select the transport requests (or changes) that you need on the next screen. You have to make a decision for every transport request that is shown. You can only create the buffer file if there is no transport request in state Undecided any more. You may choose “Select All” in case you’d like to add all transports to the buffer file. You can anyhow click Next at any time. Your decisions will be stored. You can come back later to make a decision for the remaining transport requests or changes (or change your opinion). The list of the transport requests might have grown when you come back next time as your developers might have released additional transport requests. If you made a decision for each transport request, you are asked for a confirmation on the next screen. If you did not make a decision for each request, then this screen looks different. You can only save your work and come back later. Now, a popup will appear which askes you whether the buffer file should be created in the attached transport directory. In order to proceed, confirm the popup with OK. Eventually, the last step gives you the opportunity to download the newly created buffer file to your local hard drive. To download the file, click on the link which starts always with the prefix UPGSEL_. Cool 🙂 – How to get it? Do you like what you read up to now? Do you need this functionality? Check the release of your system. 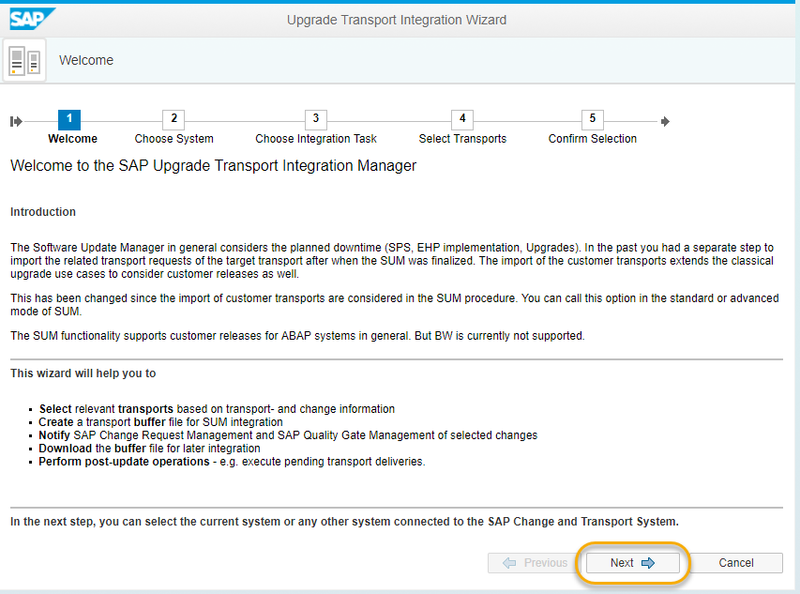 You can use the transport integration wizard out of the box in your SAP backend if you are on SAP_BASIS 7.50 SPS08 or SAP_BASIS 7.51 SPS03 and higher. For lower releases, the functionality is provided as a Transport Based Correction instruction (TCI). 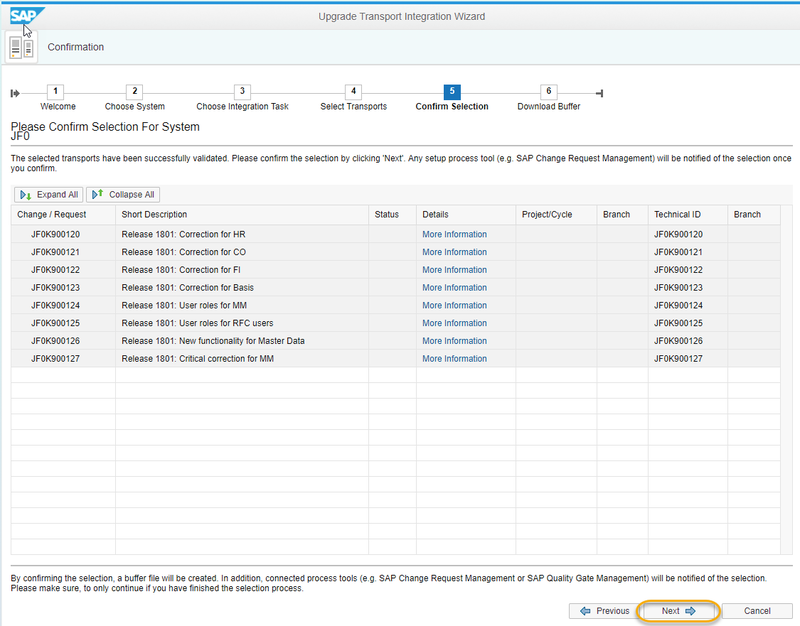 Check SAP Note 2450902 Customer Transport Upgrade Integration Wizard for supported releases and to get the TCI. If you use Change Request Management (ChaRM) or Quality Gate Management (QGM), you should call the wizard on SAP Solution Manager. With this, you can still create the buffer file specific for the system that you would like to upgrade but you gain the option to select the transport requests based on Change Documents. 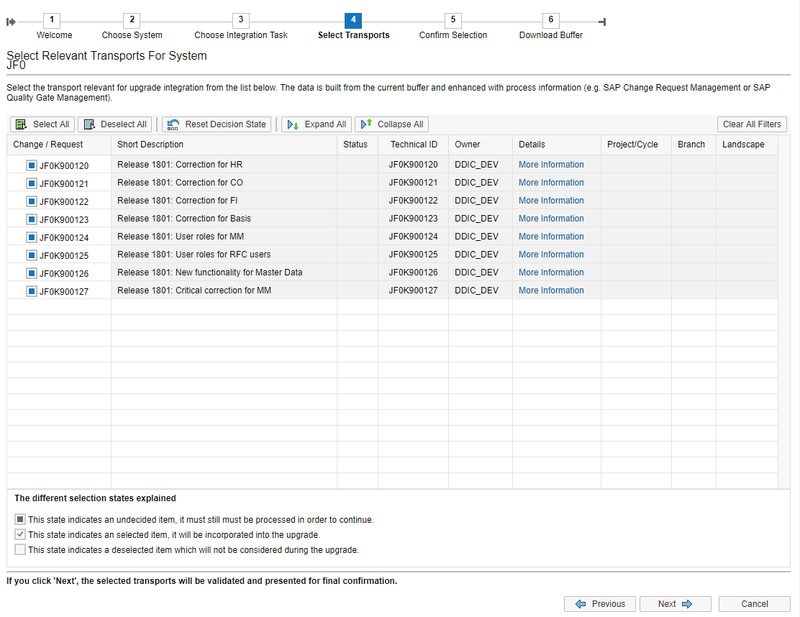 For more information on Customer Transport Integration in SUM, see SAP Note 1759080 – Conditions for SUM including customer transport requests. Don’t miss the following restriction described in this SAP Note: “All customer transports have to be tested and verified by the customer.”.